David Singer’s first poster for Bill Graham, BG-178, advertised performances by The Who, Santana, and Ike & Tina Turner. Image via David Singer. One May morning in 1969, David Singer walked into the Fillmore West in San Francisco in the hopes of meeting Bill Graham. The day before, Singer had shown some of his photo collages to the acclaimed rock-poster artist and “Zap Comix” contributor Victor Moscoso, who’d been recommended to Singer by a printer they both knew. Should he turn his collages into greeting cards, Singer had asked? Perhaps they’d sell better as head-shop posters? Moscoso said he didn’t know much about greeting cards, and noted that respected head-shop poster publishers like Berkeley Bonaparte were going out of business. 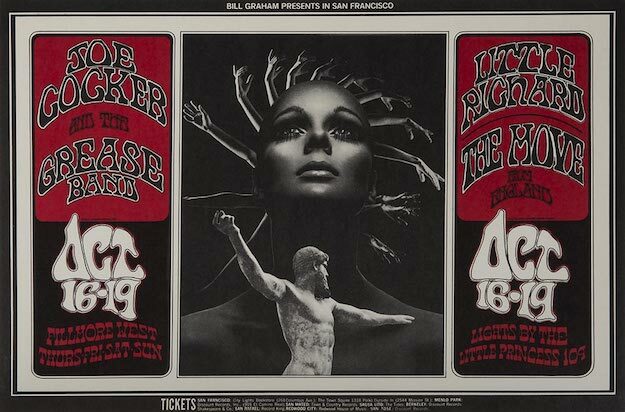 But Moscoso liked Singer’s work, so he suggested that Singer pay a visit to Bill Graham, who was commissioning a poster a week for the rock concerts he was producing at the Fillmore West, Winterland, and a couple of other venues. “He’s the only game in town right now,” Moscoso had remarked. And so off Singer went, to see if the notoriously busy and blunt-spoken rock impresario might deal him a hand. The collages Singer hoped to show Graham that morning featured photographs Singer had cut from the pages of old magazines to create, as he would later put it, “visual poems.” One of the visual poems he was carrying in his fancy black-leather portfolio featured an ancient Greek statue standing before two horses grazing far off in the distance. Looming behind the tiny animals was an immense stone archway. For Singer, the orientation of the statue so that it was looking away from the rest of the collage symbolized the past, the living horses symbolized the present, and the archway positioned on a horizon that opened to sky and clouds suggested the future. Other collages in his portfolio were more like visual puns—how else to describe an endless field of red tulips, above which floated two pairs of lipstick-red lips? While some of David Singer’s collages could be described as “visual poems,” this one, BG-180, is more like a “visual pun.” Image via David Singer. Poems or puns, Singer’s timing turned out to be fortuitous. That same month, Graham had ended his relationship with artist Lee Conklin in a dispute over 50 bucks; one did not argue with Bill Graham about money. 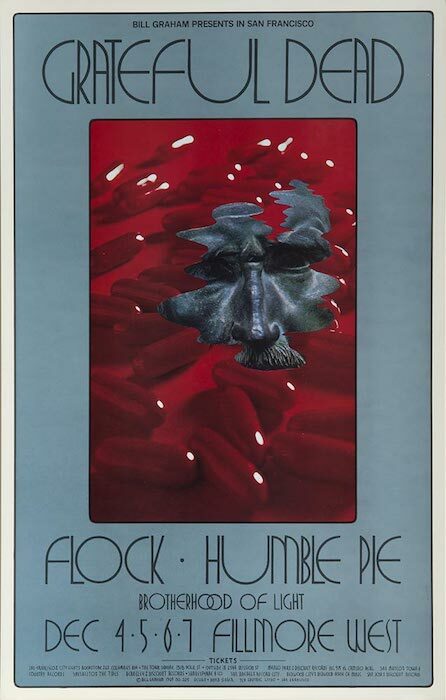 Many of the 33 concert posters Conklin had created for Graham since January of 1968 had featured the artist’s original drawings of naked figures trapped in bad-acid-trip dreamscapes, his fleshy worlds and the lost souls who populated them often assembled from disembodied breasts, noses, ears, fingers, and feet. Conklin’s work was kind of creepy, difficult to decipher, and totally cool, perfect for late 1960s San Francisco. For Graham, the loss of Conklin was a minor inconvenience in a business where existential threats were routine, whether it was an overly inquisitive fire inspector or a prima-donna rock star. Besides, Graham had other artists in his stable. Foremost among them was Randy Tuten, an up-and-coming artist, who melded a sophisticated flair for graphic design with a psychedelic sensibility. In Tuten’s hands, a posterized painting from 1912 of a sinking Titanic, surrounded by old-timey lettering, became an unlikely advertisement for Creedence Clearwater Revival, while a photograph of an avocado adorned with goofy googly eyes was all Tuten needed to hype Led Zeppelin. 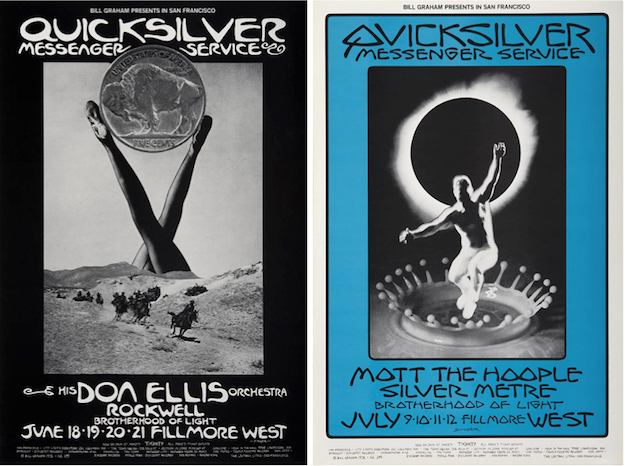 Immediately prior to David Singer’s arrival on San Francisco’s rock-poster scene, Fillmore West posters were designed by artists like Lee Conklin (BG-172, left) and Randy Tuten (BG-174, right). Images via Fine Arts Museums of San Francisco and Randy Tuten. All things being equal, Tuten’s assignments should have skyrocketed after Conklin’s departure. But then David Singer showed up, which shouldn’t have mattered, because in May of 1969, no one would have pegged Singer as the guy who would eventually create more rock posters during Bill Graham’s heyday than any other artist. By San Francisco standards, Singer was kind of a square. 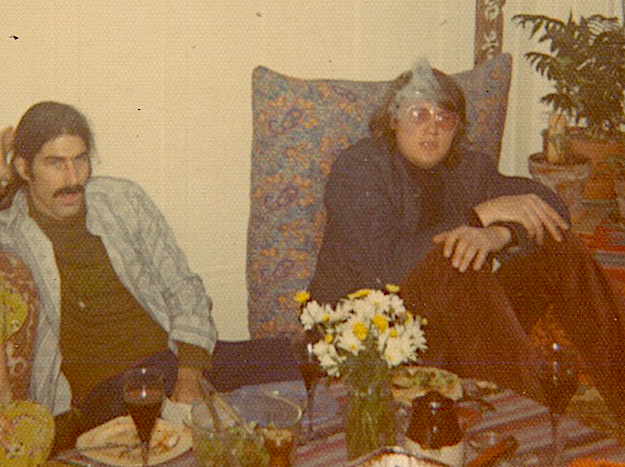 Sure, he was an aspiring artist, but his life history—a childhood in rural Pennsylvania, a stint in the Navy as a radio operator, a middling career doing marketing for shipping companies and wineries—was hardly preparation for following in the footsteps of Wes Wilson, Alton Kelley, Stanley Mouse, Rick Griffin, and Victor Moscoso, the giants of San Francisco’s psychedelic rock-poster scene. To make matters even more difficult for himself, Singer’s aesthetic sensibilities leaned toward Surrealism, with perhaps a splash of Dada, but his work was definitely not psychedelic. As for Singer’s medium of collage, that choice seemed downright creaky. 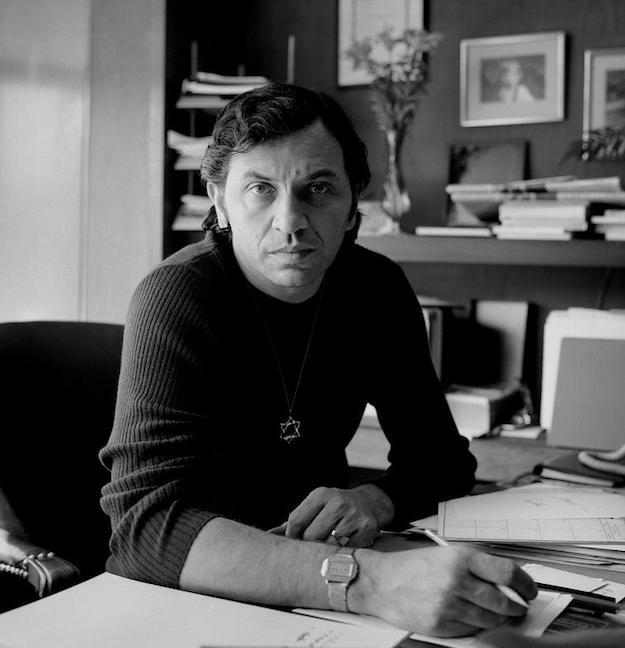 Rock promoter Bill Graham, who, as a child, was sent to the safety of the United States during World War II, wore a Star of David. Throughout his life, he was a supporter of Jewish causes. Image via Down in the Groove. But Singer had been directed to Graham, and to Graham he would go. “I knew where his office was because I had been to Fillmore West many times,” Singer tells me during one of numerous interviews we conducted at his home, along with countless other less-formal conversations. “Bill had a receptionist named Marushka Greene, photographer Herbie Greene’s wife. Her desk was in front of Bill’s door, so you couldn’t just waltz into his office, even though the door was open. So, I walked up to Marushka and explained that I wanted to show my artwork to someone. She said, ‘You’ll have to show it to Bill.’” From her side of the desk, Greene could turn her head to see that Graham was on the phone—it would have been unusual if he wasn’t—so she punched a button on her intercom and called for Pat Hanks. At the time, Pat Hanks was Bill’s right-hand man, trusted enough to run interference for the boss when artists showed up with their portfolios hoping to get a shot at designing a Fillmore poster. That happened a lot. Designing a poster for Bill Graham was no guarantee that an unknown artist would become the next Victor Moscoso, but that was certainly the hope. It was, in short, the room where the pipe dreams of would-be rock-poster artists went to die. This Singer poster, BG-182, features one of the 12 original “visual poems” selected by Bill Graham in May of 1969. Image via David Singer. 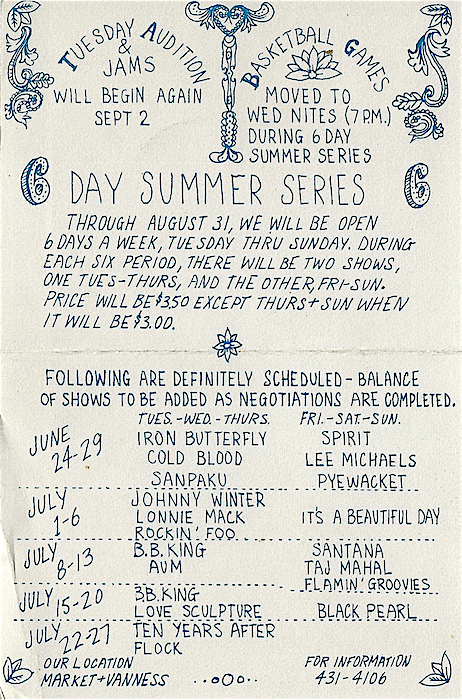 During the summer, when school was out, Bill Graham ran shows six nights a week rather than four. He called these shows his summer series. This calendar was printed on the back of the postcard version of David Singer’s first poster for Graham. Unbeknownst to Singer, Graham had just finished booking 12 weeks of concerts from the middle of June until early September. Each of those weeks would need a poster, and each of those posters would be packed with information. Normally, Graham ran shows on Thursday through Sunday nights, but during the summer, when lots of high-school and college students were on vacation, he could pack the Fillmore West with crowds on Tuesdays and Wednesdays, too. That meant that in a single week, Graham might step up to the stage microphone and introduce, say, The Who on Tuesday through Thursday, June 17-19, Santana on Friday, June 20, and Ike & Tina Turner on Saturday and Sunday, June 21-22. 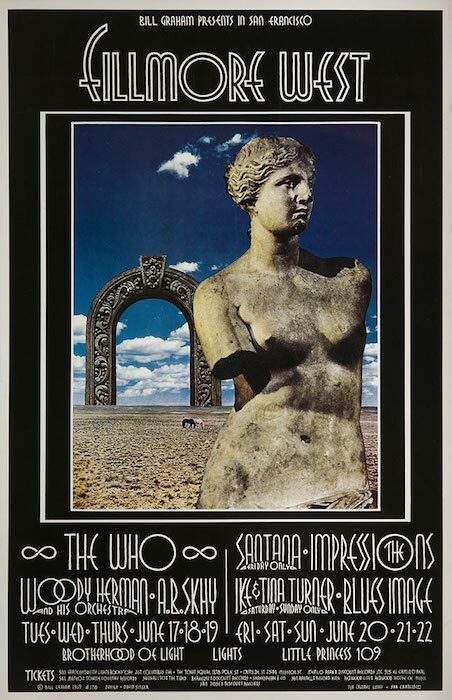 In fact, those are the actual names of the headliners and performance dates on David Singer’s first poster for Bill Graham, the one with the collage of the statue, the two horses, and the archway. This David Singer poster for a Moonalice show at Slim’s in 2009 is one of more than 120 the artist has designed for the band. Image via Moonalice. 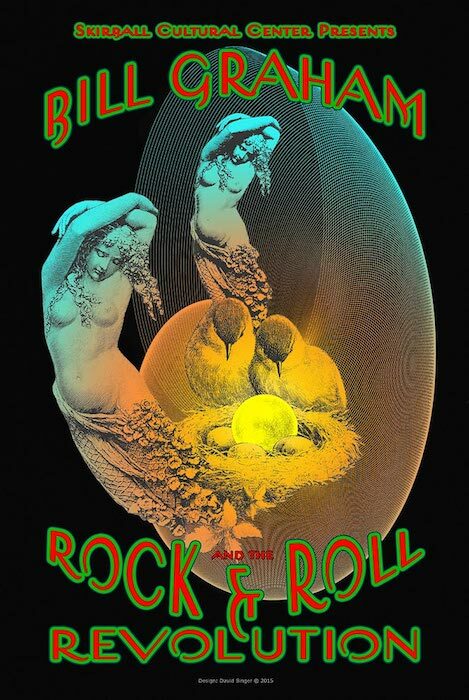 The answer was a career that continues to this day: Among other accomplishments, since 2007, Singer has designed more than 100 posters for a band called Moonalice. Who knows whose paisley-decorated cardboard portfolio Graham and Hanks might have rescued from poster purgatory if Singer hadn’t knocked on Bill Graham’s door that morning. Ironically, David Singer did not set out to become a rock-poster artist, hence his initial questions to Moscoso about greeting cards and head-shop posters. 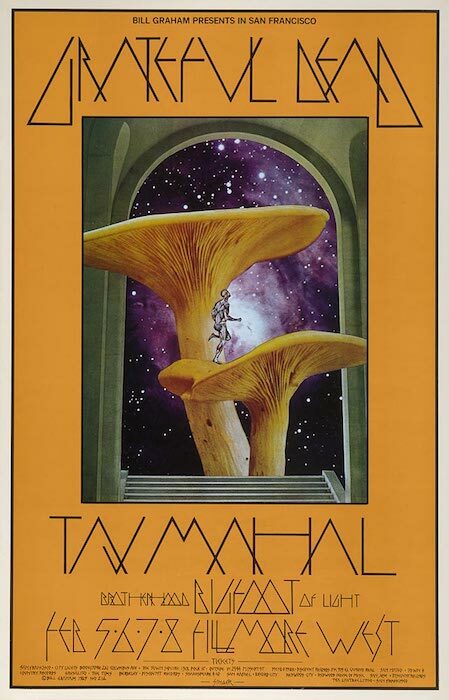 “I didn’t really see myself doing ballroom posters,” is the way Singer explains it to me, “ballroom” being a reference to the concerts promoted by Chet Helms at the Avalon Ballroom from 1966 to 1968 and by Graham at the Carousel Ballroom, which was the name of the Fillmore West before Graham took over the lease from Jefferson Airplane and the Grateful Dead in the summer of 1968. But Singer was intent on giving a career as an artist a try. That’s why, a few months before his meeting with Graham, Singer had quit a good-paying job in marketing to force himself to give it a go—his fancy portfolio, the one that had caught Hanks’ and Graham’s eyes, had been a good-luck parting gift from his previous employer. 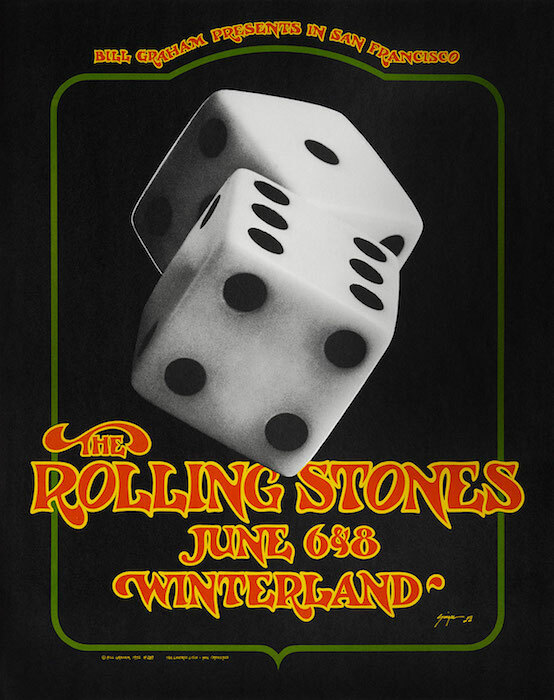 David Singer originally proposed a variation of this design for a 1969 Rolling Stones poster, but Bill Graham gave the assignment to Randy Tuten. In 1972, when the Stones returned to the San Francisco Bay Area, Graham asked Singer if he still had his 1969 artwork. 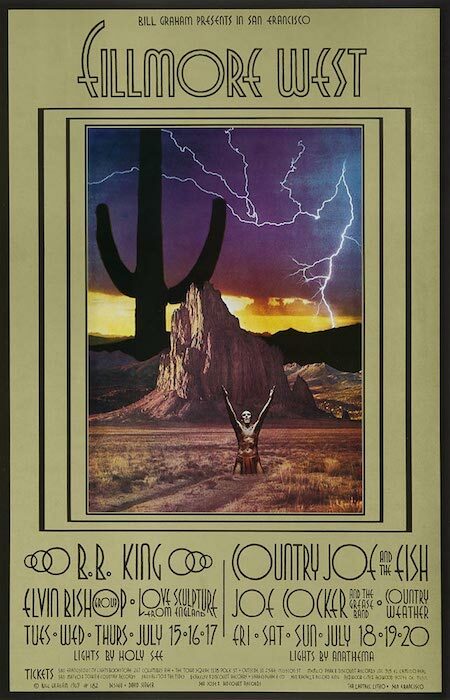 He did, and the result was this poster, BG-289, for four shows (two on each date) at Winterland. Though not noted on the poster, Stevie Wonder opened. Image via David Singer. When the Fillmore West closed in 1971, there had been no time to print a poster beforehand, so this Singer poster, BG-287, was printed after the show. It was presented to Graham as a surprise by Singer at an exhibition of the artist’s work several months later. Image via David Singer. The source of his innate iconography was rural Pennsylvania, where Singer was born and raised. 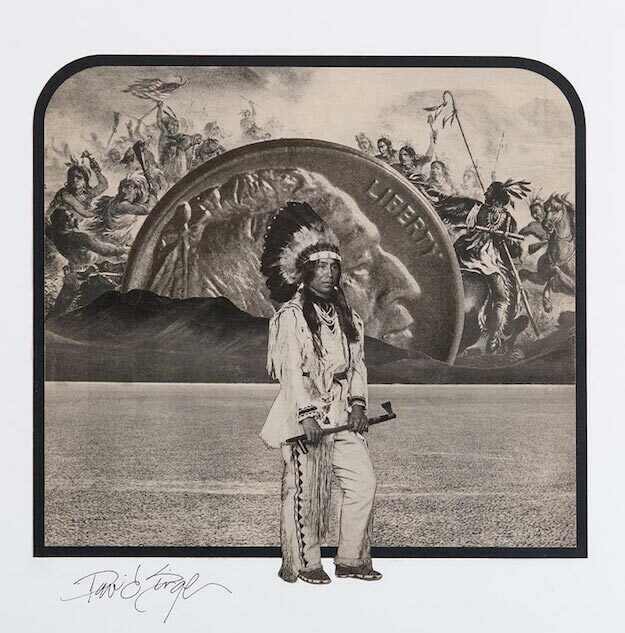 Like the artwork he produced for Bill Graham, Singer’s early years are a collage, composed not of images cut from old magazines but of family members stepping out of and into his life. Born in 1941 in Bethlehem, Pennsylvania, as David Richard Carol, Singer’s dad was a musician named William Zboyovsky, who changed his name to Rudy Carol because it was a better name for a performer. Singer didn’t know his father because Carol left Singer’s mother, Ruth, when Singer was barely a toddler, and he never saw him again. Tragically, Ruth died when Singer was 4, leaving him in the care of Ruth’s older sister, Dorothy, and her husband, Galen Holsinger, who lived in Quakertown, half an hour south of Bethlehem. Singer was formally adopted by Dorothy and Galen and refers to them as his parents (he similarly refers to their daughters, Dorice and Linda, as his sisters), but when it came time for him to decide how to sign his first rock poster, he elected to shorten the name he grew up with, David Holsinger, to David Singer. 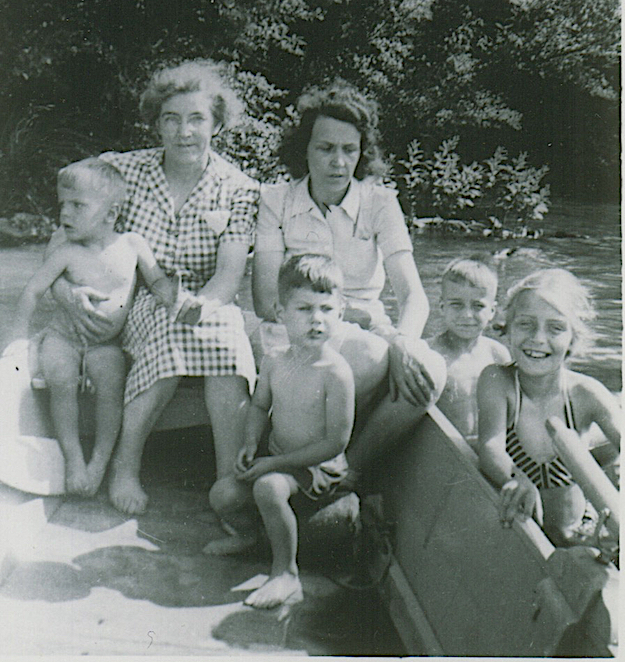 David Singer (center), with his mother, Ruth, behind him and his grandmother, Meme. Singer’s mother died of cancer by the time the boy was 4 years old. 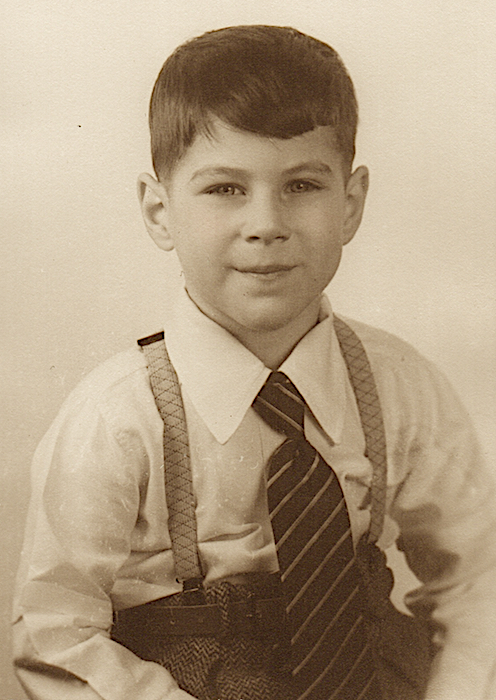 David Singer, circa 1940s, Quakertown, Pennsylvania. The home where Singer grew up featured a storefront where Singer’s adoptive father, Galen Holsinger, conducted business. 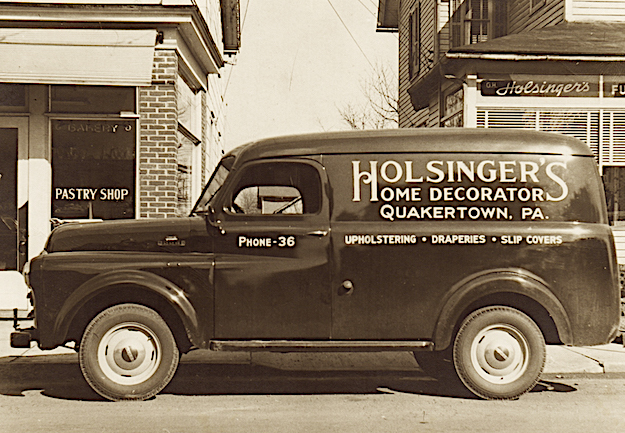 Singer helped Galen strip furniture and make deliveries. 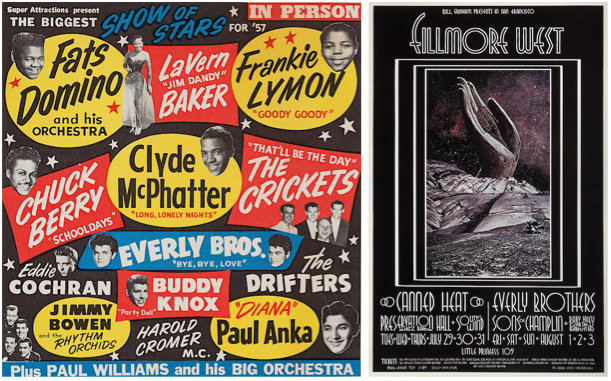 The first time Singer saw the Everly Brothers in the late 1950s, music posters looked like this (left). 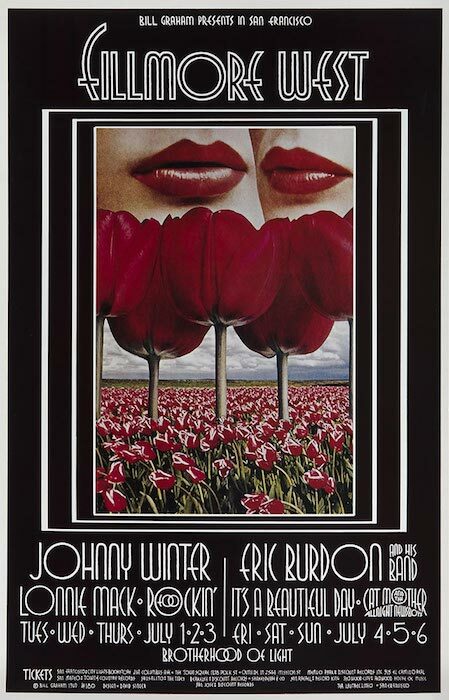 Years later, in 1969, Singer was asked by Bill Graham to create an Everly Brothers poster, BG-184, of his own. Image on right via David Singer. 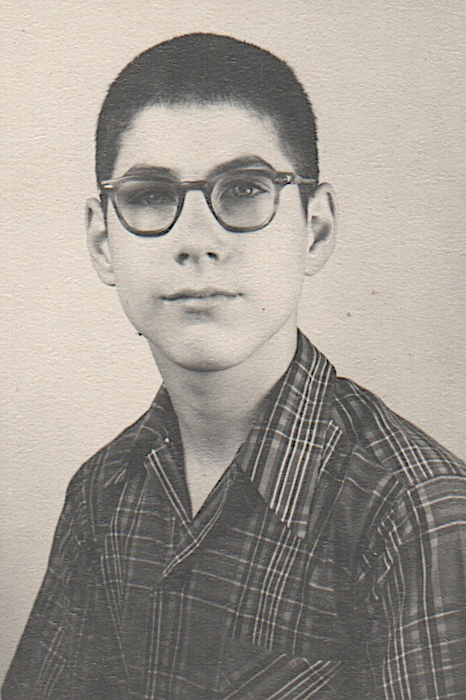 David Singer, circa 1950s, Quakertown, Pennsylvania. For David Singer, a small-town kid from Quakertown, Penn State University, where he attended collage for a year, seemed impossibly huge. 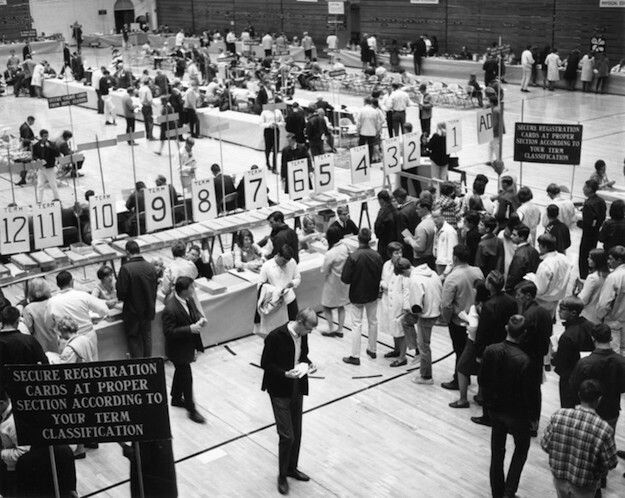 This is what registration day looked like in the mid-1960s. Image via Penn State University Archives. 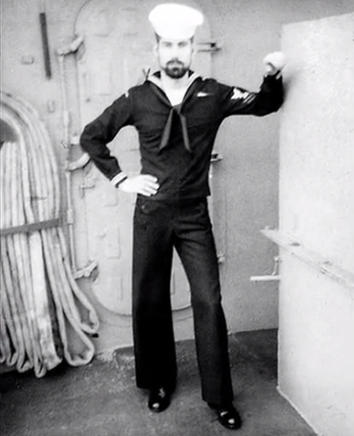 Portrait of the Artist as a Young Seaman: David Singer, circa 1962. And so, just like that, in 1960, Singer left Pennsylvania for basic training in California. Mike met him there, but after boot camp, the two friends were sent in different directions. They would reconnect at the end of their tours. “I made high marks in Morse Code training at the radio school in San Diego,” Singer says, “so they put me in charge of 12 guys and sent us to Okinawa, where the Navy had an air station with a communication center. They put us on a troop ship with like a couple thousand Marines, Navy, Army, and Air Force guys. The living spaces were filled with tiers of bunks, three or four high. Oh, man, what a trip. 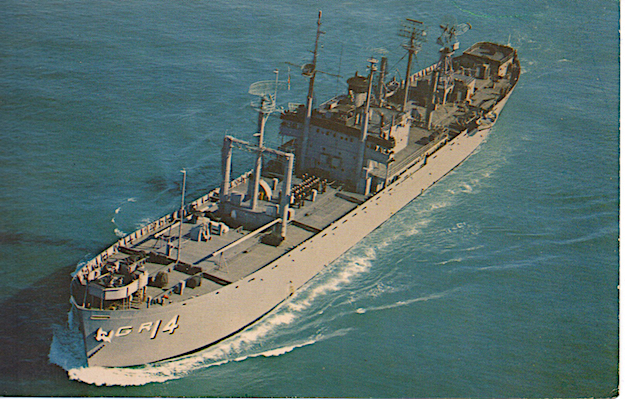 Postcard of USS Interpreter (AGR-14), the ship David Singer was assigned to from 1962 to 1964. When it was not at sea, the Interpreter was stationed in San Francisco Bay. Singer also tried to get into art school, to see if his high-school doodling and fascination with Pennsylvania Dutch art might lead to a post-Navy career. “I went to Los Angeles to meet the admission directors of several art schools. They all turned me down.” At the time, the rejections must have been disappointing, but Singer believes it probably worked out for the better in the long run. “I think my success was partly due to not going to art school,” he says. 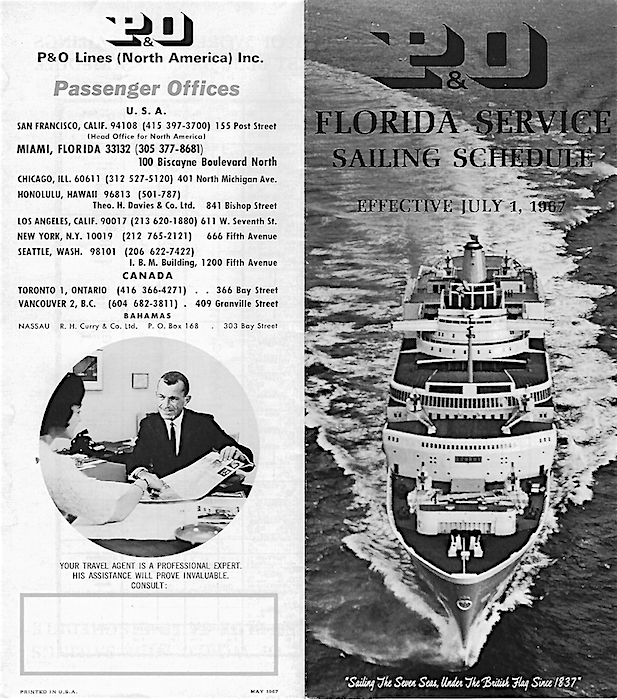 One of Singer’s boring, design-adjacent jobs was to keep track of schedules for the P&O-Orient Line, and deliver those schedules to the designers who would create promotional materials like this. Eventually, Singer got a job and a place to live in San Francisco. “Within a couple of years,” he says, “I’d had a bunch of downtown jobs, regular jobs where I had to wear a shirt and tie at work.” But by 1966, Singer’s uninspiring career path seemed a stark contrast to the city’s burgeoning music scene, in which rock concerts were regularly presented at the Fillmore Auditorium—the precursor to the Fillmore West, for which Singer would do so many posters—and the Avalon Ballroom, as well as at venues such as California Hall and Longshoremen’s Hall. One of Singer’s favorite bands was Quicksilver Messenger Service. 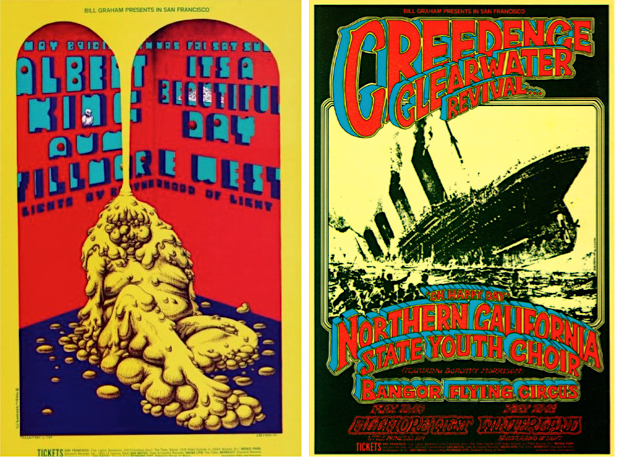 In June and July of 1970, he designed these two posters—BG-239 and BG-242—for the group’s shows at the Fillmore West. Images via David Singer. Whenever he could, Singer would linger at the graphic-arts studios he’d visit while he was delivering P&O schedules, picking up whatever scraps of knowledge he could from the designers while they worked. 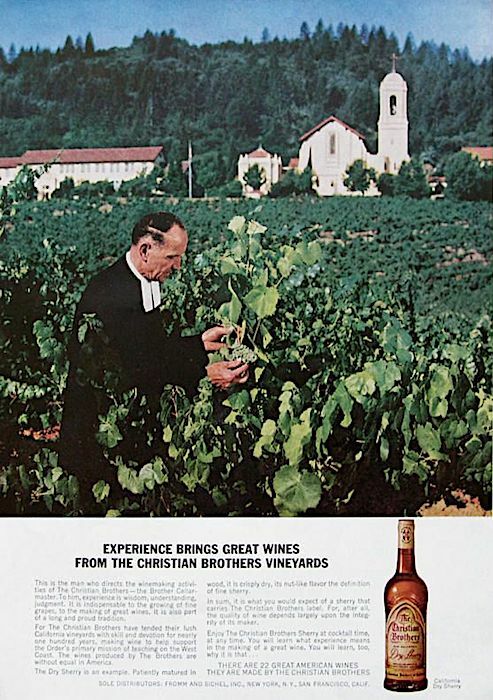 Singer also worked for Fromm & Sichel, the marketing and distribution arm for Christian Brothers. As at P&O, his role was to manage creative assets rather than to be creative. George Hunter’s design for the cover of It’s a Beautiful Day’s first album was the catalyst for David Singer to see the band at the Fillmore, after which he quit his day job to try and make it as an artist. It was on the outside that Singer was introduced to George Hunter, who had recently left one of San Francisco’s first rock bands, the Charlatans, and started his own graphic-design business, Globe Propaganda. Singer took his advice and walked over to Hunter’s offices on a lunch hour. “He was the first person I met in the rock-poster world, which is interesting because George did the first rock poster,” Singer says. Along with bandmate Mike Ferguson, Hunter had designed the so-called “Seed” poster for the Charlatans’ residency at the Red Dog Saloon in Virginia City, Nevada, in the summer of 1965. 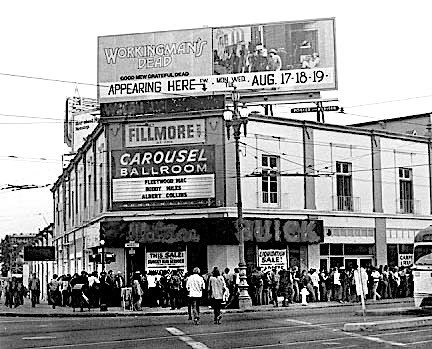 A crowd waiting to get into the Fillmore West was a common sight at the corner of Market and Van Ness. Singer designed the poster for the 1970 show on the marquee, which advertised Fleetwood Mac, Buddy Mills, and Albert Collins. Amid all of this, one object in particular caught Singer’s eye—an album cover that Hunter had just designed for a band that would soon rival Quicksilver in Singer’s esteem, It’s a Beautiful Day. “When we were talking, I asked him what he’d done recently. 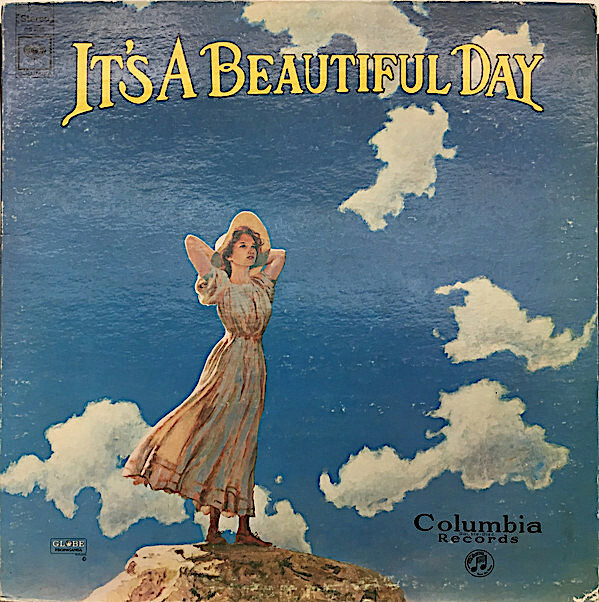 That’s when he showed me the It’s a Beautiful Day album cover.” For the cover, Hunter had taken a painting by L. Kent Hollister, which was actually based on a similar painting by American Impressionist Charles Courtney Curran, and combined it with an old Columbia Records font. 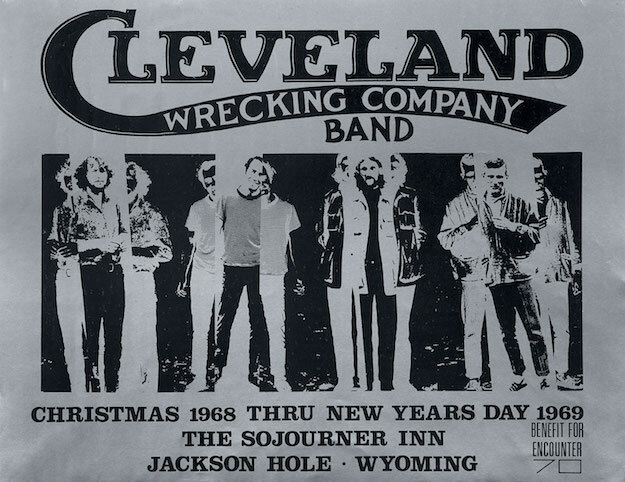 This poster for a residency by Cleveland Wrecking Company at the Sojourner Inn in Jackson Hole, Wyoming, is Singer’s only published poster prior to his work for Bill Graham. Image via David Singer. Singer returned to his childhood interest in magazines and collage, the interest that had been kindled by his great-aunt Flossy’s scrapbooks with all their pictures of cats and dogs. “I had been living in a place up on Frederick Street for a couple of years,” he says. “It was about three blocks up from Haight Street. It had a hardwood floor, so I took all the furniture out of the living room, scrubbed the floor clean, set out my boxes of pictures I’d collected, and started working on the floor. It was a nice, big, flat surface for collaging. I had a couple of file boxes filled with pictures that I had cut out over the years, but as I started collaging, moving the pictures around on the floor, I realized I needed more. Which brings us back to that May morning in 1969, about six months after Singer quit his job at Fromm & Sichel to see if he could make it as an artist. After Singer agreed to do the summer series and convinced Graham that he knew how to do hand-lettering, Graham picked up his phone and motioned to the door. “He said, ‘You wait outside. I’m calling the printer.’” Singer remembers. 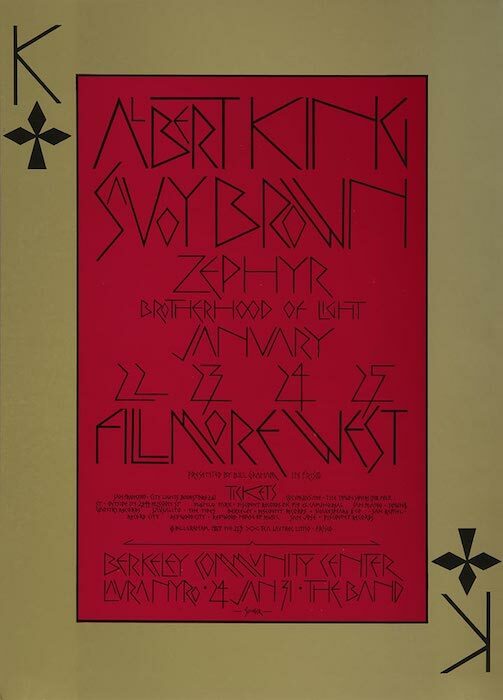 David Singer worked closely with Levon Mosgofian, who ran Tea Lautrec Litho and printed all of Bill Graham’s posters beginning in the summer of 1967. Graham was mostly concerned about the cost. “He knew it would be more expensive to print in four colors, rather than two or three,” Singer says, “but Levon thought he could get Bill a deal on the prepress work.” In fact, that first day, it was still an open question whether Graham would want to pay for four-color printing. 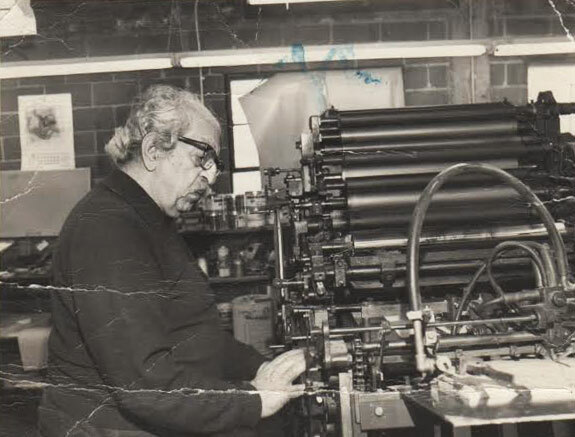 In the end, Mosgofian found a prepress company that agreed to gang-separate the first 12 collages on two sheets and then cut them up, rather than doing individual, and costly, prepress work for each poster, one at a time. That small efficiency was enough for Graham to eventually give Mosgofian the green light. But on that first day, when Singer accompanied Mosgofian to Tea Lautrec Litho, there were still important details to nail down. For example, before Mosgofian could get a quote on the separations (the pieces of film that would break Singer’s collages into their component colors for printing), he needed to know how much of each 14-by-22-inch poster would be devoted to Singer’s collage. 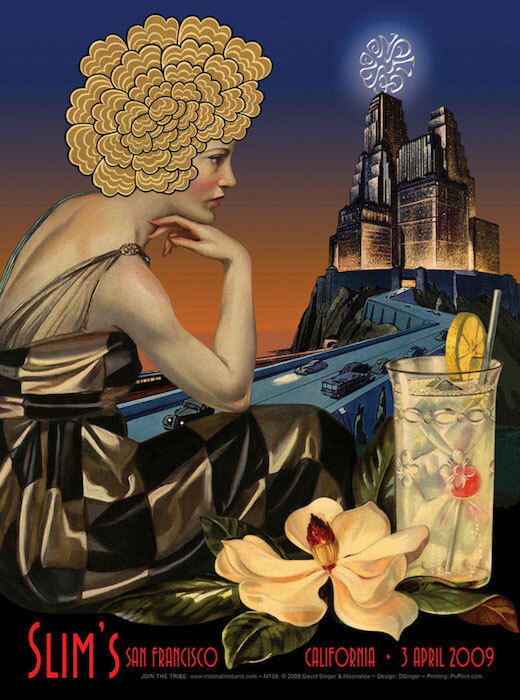 The last of Singer’s summer-series posters, BG-190, has a smaller collage than the others, but the Art Deco lettering remains the same. Image via David Singer. Other than picking out those first 12 collages, Graham gave Singer very little direction. For example, Graham told Singer that it didn’t matter to him which of Singer’s collages was printed first, second, or 12th, so the choice of pairing collage imagery with band names was up to Singer. But Graham did care how those bands were represented on the final posters. To make ends meet during his years making Fillmore posters, Singer sometimes hawked “Berkeley Barb” newspapers on the streets of San Francisco. As an artist, he also designed a few covers for the “Barb.” This collage is the original artwork for one of those covers. Image via David Singer. Even after the format of the posters had been decided and the cost of the gang-separations had been approved, there was still one small detail Singer and Graham had not discussed. “We hadn’t talked about money yet,” Singer says. “When I saw Bill again a week or two later, I finally asked him what he was going to pay me. He said, ‘I’ll pay you what I pay all my other poster artists, a hundred dollars a poster.’ I thought, ‘A hundred dollars a poster? That’s not a lot.’” In fact, it was so little, Singer had to take on a side hustle to make ends meet, selling “Berkeley Barb” newspapers on a street corner in the Financial District where he had once worked. Singer knew that being a poster artist for the Fillmore would not be especially lucrative, but he hadn’t expected the pay to be that bad. Other artists in Graham’s stable may not have been so pleased with the promoter and his new poster artist. “I think Randy Tuten was a little bent that I had suddenly grabbed 12 posters,” Singer says. “But when I went in to see Bill that first time, I didn’t know that was going to happen. It was a fluke. David Singer and Randy Tuten collaborated on this poster, BG-196, for Bill Graham. Tuten did the design and lettering, and Singer provided the collage. Image via David Singer. Singer would not get another assignment of his own from Graham until December, when he would do four posters in a row, two at a time, beginning with a poster for four nights with the Grateful Dead, Flock, and Humble Pie, whose members at the time included a young, hotshot guitarist named Peter Frampton. This Grateful Dead poster, BG-205, is generally considered to be an anti-drug poster. It’s also noteworthy because the Dead did not play the last show of the four-night run, having suffered through a traumatic day at Altamont. Image via David Singer. The poster is famous for two reasons. First, it’s one of only a very few by Singer with a direct reference to drugs—the ominous, blood-red foreground is littered with loose Seconal capsules. 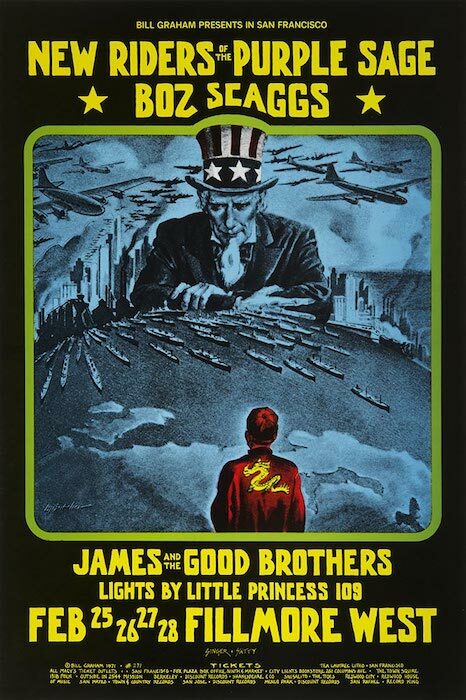 The poster’s other claim to fame has to do with one of the dates on the poster, December 7, 1969, which is not only the anniversary of the Japanese attack on Pearl Harbor in 1941, but also the same day as the ill-fated concert at the Altamont Speedway in Northern California. The Dead were supposed to play at Altamont in the afternoon as one of numerous openers for the Rolling Stones, after which they planned to head back to San Francisco for their evening show at the Fillmore West. But there was so much violence at Altamont, the band decided not to play at all, hoping the Stones would go on early to bring an end to the unfolding nightmare. The Stones didn’t take the hint, preferring to wait until the sun had set so that the filmmakers they’d hire to shoot a documentary of the Stones’ 1969 U.S. tour would be able to get dramatic shots of the band performing under stage lights. Instead, the filmmakers captured footage of an audience member being stabbed to death only a few yards from the stage. In the end, the Dead didn’t play at the Fillmore that night, either. 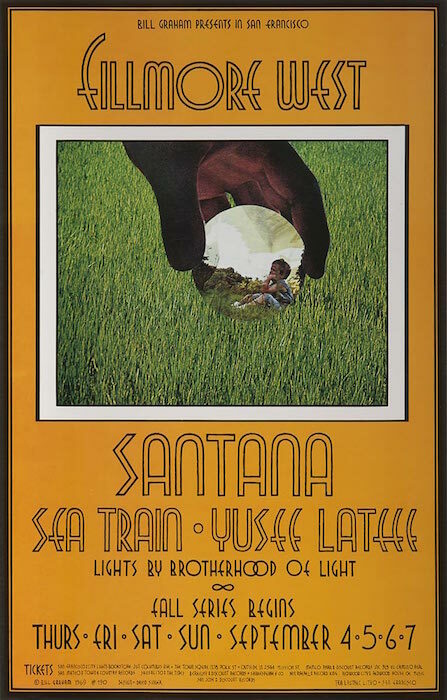 In terms of the poster’s visual content, drugs had long been a part of the San Francisco music scene. So-called psychedelic drugs such as LSD were positioned as doorways to enlightenment, which they often were. But so-called “hard drugs” had turned lots of kids into speed freaks and junkies. 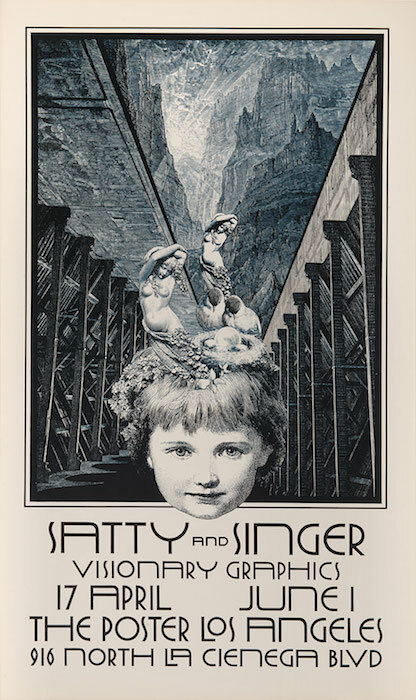 This poster, circa early 1970s, advertises the only joint show of work by Singer and Sätty. Image via David Singer. Singer only collaborated on a few Fillmore posters with Sätty, including this one, BG-271. Image via David Singer. Sätty’s studio was in an old building in the North Beach neighborhood of San Francisco, the part of town where the Beat scene had taken root in the 1950s. “He worked in a storefront at street level—there was a door to the side that went up to some apartments upstairs. He had left the downstairs door open so I knocked and walked in. Sätty was sitting in a chair snipping pictures. He always had a box full of paper that he was cutting out. He offered me a chair, and we talked for about half an hour, just getting acquainted. 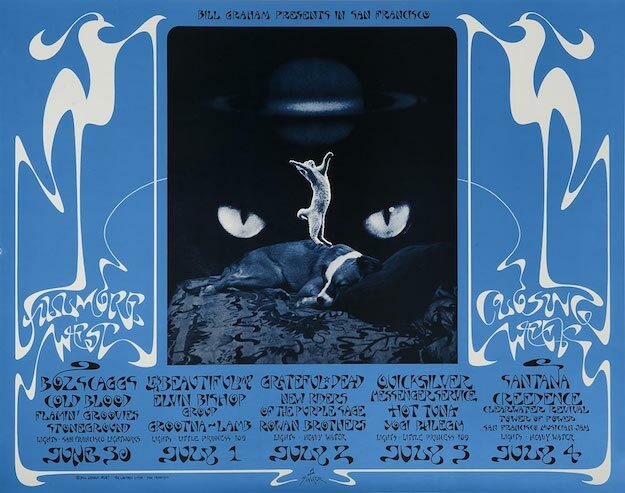 Singer made this poster for his solo exhibition in 1971, where he also presented Bill Graham with BG-287, the poster he created for the closing week of the Fillmore West a few months earlier. Image via David Singer. Singer (left) and Sätty (right) in the early 1970s. For Singer, magazines were still his preferred source of images, and now that he had a regular flow of assignments from Bill Graham, he was running out of raw materials. That changed when he got a call from a bookstore he frequented about a customer who had offered the store a huge cache of magazines. The store didn’t want them, but thought Singer might. “She had a long, narrow basement that ran the whole length of the building,” Singer recalls of the woman who was trying to get rid of her magazines. “Along one side of the room, from front to back, were stacks of them, waist-high. It was amazing. She said her father had subscribed to everything—’Life,’ ‘Look,’ ‘Fortune,’ ‘Time’—and never threw anything out. This was his whole collection. She had just sold the house, so she needed to get rid of them.” It was an enormous haul, and best of all, the price was within Singer’s budget: a few signed Fillmore posters and a promise to haul the magazine away. Another Singer-Sätty collaboration, this one to support the presidential candidacy of George McGovern, who ran unsuccessfully against Richard Nixon in 1972. Image via David Singer. This helped explain why his adoptive parents, Dorothy and Galen, didn’t want to talk about Singer’s abandonment by his father or the death of his mother: He realized that their reticence was at least partly due to an overall pattern of behavior they’d adopted as a protection mechanism. This Singer poster, BG-213, is one of only a few Fillmore posters not to have the words “Bill Graham Presents in San Francisco” at the top. Singer put the line in the lower-middle portion of the poster, and much to Graham’s consternation, shortened “Francisco” to “Frisco.” Image via David Singer. After the four posters he designed for Graham in December of 1969, Singer got five more assignments in January of 1970, including the two that he would mistakenly label with the word “Frisco,” followed by another dozen or so assignments that would keep him cutting and pasting through the spring. In retrospect, Singer is happy with most of those posters, “but there were some that I don’t care for much now and wish I’d had more time to plan them out, especially the color scheme. For his Aretha Franklin poster, BG-272, Singer placed his hand-lettering on top of a Jim Marshall photograph of the Queen of Soul. At the last minute, Graham had Singer add the words “Recording Live at Fillmore West.” Image via David Singer. This was a highly formative period for Singer, who was learning the tricks of his new trade by practicing his craft day in and day out. One arcane but revelatory bit of knowledge came at a prepress house called Circus Litho, which did most of the film work for Tea Lautrec, Graham’s printer. Because Singer’s source images were all cut from the pages of magazines, their colors were formed of small dots. Singer wondered why the incredibly sophisticated camera at Circus Litho, which was used to make prepress film of Singer’s collages, didn’t simply pick up all those dots, thus distorting the color of his images since the posters Tea Lautrec printed also laid down a matrix of dots to produce their color. The so-called “mushroom man” poster, BG-216, is one of David Singer’s most collected and iconic Fillmore designs. Image via David Singer. In a poster Singer created for an exhibition about the life of Bill Graham, originally presented at the Skirball Cultural Center in 2015, Singer repurposed elements from a collage he did in the early 1970s. Image via David Singer. As it turns out, Singer’s biological father, William Zboyovsky, another important Bill in Singer’s life, was Jewish, although Singer was raised Lutheran by his adoptive parents, Dorothy and Galen. 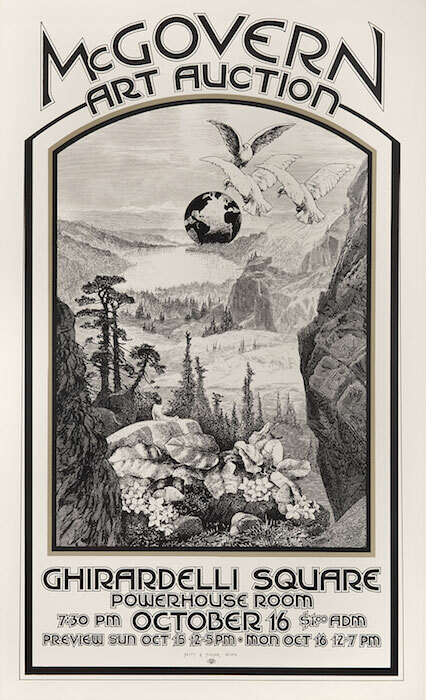 Whatever the reason for their connection, in the end, Singer would design a total of 75 posters for Graham, the last being for a show by Paul McCartney at UC Berkeley in 1990, about a year and a half before the rock promoter died tragically in a helicopter accident in 1991. By then, Singer had finally learned why his biological parents had parted ways, and why his father may have thought it best to never attempt to see his son again. But that, as is often the case when talking about the life of David Singer, is another story. Singer was the best of the lot in those days. I used him myself for one or two covers for Organ Magazine. Super guy and an amazing eye and talent. Great discipline too. Glad to see this article and only wish I still had my personal copies of Organ but they were destroyed in the Paradise California Camp Fire late last year. Glad to see you’re still standing, Singer. an important artist, thanks for this article but what really blew my mind is his typography. Truly unique and innovative. I wonder if he has created any type fonts based on his Fillmore posters? 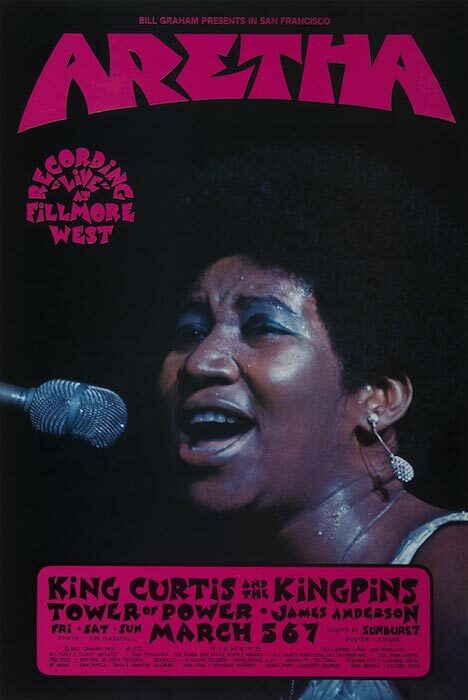 I remember Singer’s work for the Fillmore West back in the 70’s. I was just entering an art school on the east coast and visiting San Francisco in the summer before fall. Everyone loved his art – and looking at them again in this article I realize how timeless they still are. And very beautiful. Superb article, Ben Marks, about a singular artist! Excellent journalism. The people and places weave in and out of personal memories of an avant garde theater family, collaborating with Sätty for our “Roll Over Alice” performance multimedia projections, working for many BGP shows and at Winterland Productions where much BGP poster art was stacked for sale. The technical info re printing techniques is very reminiscent of our little theater family’s struggle for color on our street flyers on our limited printing budget! Without Singer’s creative resources and Bill’s budget, we would create the text with Letraset, photocopy onto bright colored paper and then hand print the header text with red markers! 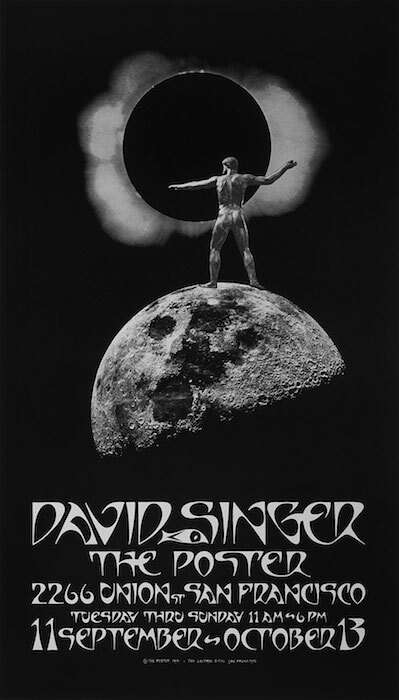 And now, years later, David Singer, your Skirball poster strikes a very emotional chord. Thanks so much for the memories! “ ” Pascal never mentioned anything about liminal reversal zones when he was binding my wrists.